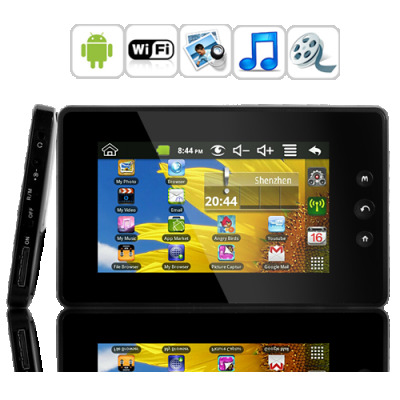 Successfully Added Mini Android Tablet "PocketDroid" - 4.3 Inch Touch Screen, WiFi to your Shopping Cart. The portable Android 2.2 touchscreen tablet that fits in your pocket without leaving a dent in your wallet, it's the PocketDroid! Quality over quantity is the motto of the PocketDroid and the smaller body does not mean we removed a few chips here and features there. In fact, it's the opposite as the PocketDroid can hold its own against most of the larger Android tablets out there! The mini tablet is driven by a 800MHz high performance processor, 300MHz DSP (digital signal processor) for video, as well as 256MB of RAM, making the whole system run and feel as smooth as silk. With Android 2.2, the PocketDroid Mini Tablet comes with everything you need from a media entertainment unit and mobile internet device. For starters, go online through WiFi and watch your favorite YouTube videos or update your Facebook status. When you're done, listen to music while looking at funny cat pictures on the internet, then send them to others through email. Next, listen to music or play a few levels of Angry Birds. Finally, log on to the free Android Marketplace and choose from thousands of free applications for any purpose! The 4GB of internal flash memory allows you to go download-happy, but just for good measure a micro SD card slot is available for external memory up to 32GB. Yes, the PocketDroid is made in China. In fact, probably in the same factory as your friend's expensive iPhone and iPad. Does that mean it's any worse because the price is so much lower? NO! Big brand name companies are marking up their products by 300% percent and enjoying a comfortable profit, but this Mini Android 2.2 tablet comes unbranded and factory-direct from an OEM (original equipment manufacturer). What does that mean? With no middle man, no brand-associated fees, and no markup, you get the lowest price possible. Don't be jealous of your friend's iPod Touch. Instead, browse the web, watch videos, play games, and do all the same things with your PocketDroid. Then, tell him how much you paid for it and watch his face go green with envy! The PocketDroid Mini Android 2.2 Tablet is also the perfect Christmas gift, the perfect birthday present, and the perfect item for resellers to list on their website. Available in our warehouse now, this the PocketDroid is brought to you by Chinavasion, the leader in Android tablet PC gadgets and wholesale electronics. Browse the internet for free with WiFi. on 2012-06-10 01:08:08 Стоит своих денег. Отличный планшетник, все работает! Дошел до Урала меньше чем за 4 недели. Отличный карманный вариант, подключил к интернету через Хуавей Е220, грузится быстро, видео не тормозит. Советую. on 2012-05-18 06:59:03 Good value for the money. Quality of product is good, but remember it has a slower processor. Ordered two and both came as promised. The volume at lowest setting; on both unit purchased, is too loud for quite listening, need volume control on headphones. Do not use finger nail as stylus, screen plastic is soft... Recommend buy. I take my Mini Android everywhere I go. It has many features, and it's sharp. I highly recommend this product. I am very grateful to you chinavasionfor his product.It is excellently perfect.